Known Members: The Announcer, Coach, Coterie Male (Brood Imperiatrix), Girl with Sign, The Host, The Hostess, "Sharon Carter", "Jane Foster", Harem Girls, "Alicia Masters", "Illyana Rasputin", "Mary Jane Watson Parker", "Yukio", "Zuri"
Powers/Abilities: The Coterie could appear as anyone, though they retained their gold-green skin and purple hair in all forms. They were programmed by unknown means to draw images from the minds of others, so as to appear as exactly what the individual wanted to see. Oddly enough, the Coterie assigned to the Hulk was both featureless and genderless, as he only wanted to be alone. Still it stayed with him, presumably to keep an eye on him. Traits: The Coterie were a humanoid race, about 6' on average, they had slender bodies, gold-green skin, purple hair and eyes that ranged from silver to red, with no visible pupils or irises. All members shown were extremely attractive, and all were holograms created by Badoon and Brood technology to deceive Earth's heroes. They were created to be as pleasant and attractive as possible, to allay any suspicions and put the heroes at ease, as the villain's Nanites began to take control of the heroes's minds, making them extremely aggressive. They may or may not have been based upon an actual race conquered by the Badoon, or, more likely, The Brood. Iron Man's scanners revealed the Hostess to be nothing more than a hovering pair of robotic eyes and a small, unidentified piece of technology in the center of the hologram's chest. The robotic eyes may have helped the TRUE COTERIE, the Badoon/Brood Alliance, as "hidden cameras" used to spy on the heroes (Voueristic little freaks). They were a rather hedonistic bunch, catering to their "guest's" every whim. History: (Contest Of Champions II#1 (fb) - BTS) - The Coterie were devised as part of a plot between the Badoon Directorate and the Brood Imperiatrix to avenge themselves upon the heroes of Earth, who had humiliated both races so many times in the past. (Contest Of Champions II#1) - Many of Earth's greatest heroes were teleported onto the Brood Imperiatrix' Acanti starcraft, (which was, of course, disguised in the living areas). The male heroes were met by beautiful Coterie "Hostesses", the heroines by handsome Coterie "Hosts", and asked to take part in a contest for the entertainment of the Coterie, to determine the Best of the Best, and were offered access to advanced alien knowledge and "Glory unlike any you have ever known." 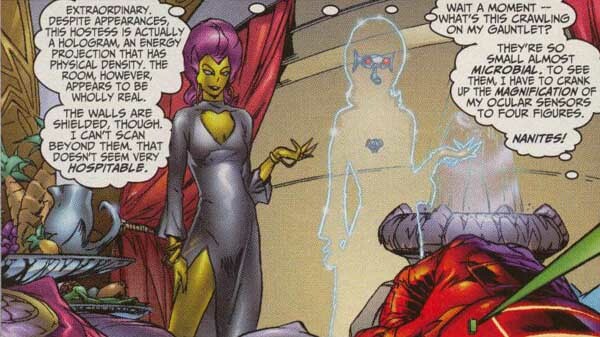 Only Iron Man, with his advanced scanners, could see that his Hostess was merely a hologram. Storm was reunited with her friend, "Yukio", Black Panther with "Zuri", Captain America with "Sharon Carter", the late "Illyana Rasputin" appeared to Kitty Pryde, who was too ill from the Nanites to notice, as Thor feasted with "Jane Foster", and the Thing and Spider-Man shared romantic moments with "Alicia Masters" and "Mary Jane" respectively. None of them seemed to notice that their "friends" all had the gold-green skin and purple hair of the Coterie. The Coterie Announcer, appearing as male to Psylocke and female to Iron Man, announced the commencement of the contest, which Psylocke lost. As she watched Tony's victory on the screen, the Brood Imperiatrix was furious at Brother Royal, whose Auguries had assured a favorable outcome, Iron Man's loss was a necessity, as his armor rendered him immune to the Nanites. Iron Man's Hostess offered him food and drink, as a way to get past his armor, but he refused, seeing the danger. 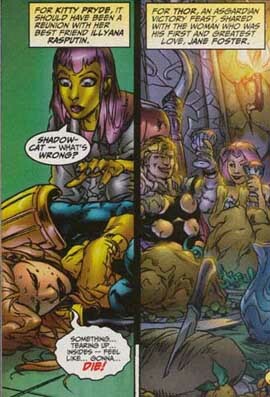 A bikini clad Coterie female holding a sign for "Iron Man vrs X-Force", and the armored hero was taken down by Jesse Bedlam and Domino, much to the Brother Royal's relief. Iron Man was teleported away. (Contest Of Champions II#2) - The Female Anouncer declared Johnny Storm's victory over Spider-Woman (Mattie Franklin), and a pair of scantily clad females began waiting on Mr. Storm hand and foot. The Announcer next declared the Hulk's victory over Reed Richards, upsetting Johnny's Hugh Hefner fantasy. Next, Johnny faced off against She-Hulk, won, and then faced Storm ,who brought his winning streak to a painful end. Iron Man, trapped with the others who had lost in an alien jungle filled with Brood Pets and Brood Princesses, re-programmed a number the Nanites to act as antibodies against the others, negating their effects..
(Contest Of Champions II#3) - The Scarlet Witch 's victory over Cable was heralded by the Male Announcer. A new Coterie, a Coach, appeared for the Basketball showdown between The New Warriors and The Slingers, which the New Warriors won, as elsewhere in the ship, the Heroes began to realize (thanks to the re-programmed Nanites) the awful truth of the Contest Of Champions, the winners would become hosts for Royal Brood Eggs, the losers, fodder for the Princesses. Iron Man and company began to slowly fight there way through the ravenous Brood Princesses toward the arena area. (Contest Of Champions II#4) - The Brood Imperiatrix took on the holographic form of a handsome Coterie male,and kissed Rogue, using Rogue's power-absorption abilities against her, and taking possession of her body. (Much like the Brood Mutant Temptress had some time before). 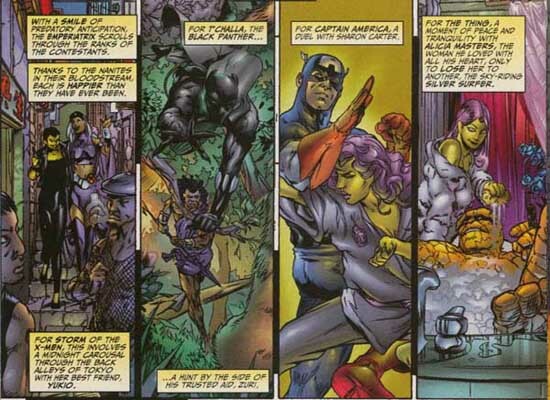 The eight remaining heroes believed she was Rogue, and Hawkeye, who'd never trusted Rogue, attempted to kill her, believing Rogue responsible for the Contest. (Contest Of Champions II#5) - The other seven remaining heroes saved "Rogue", only to be attacked by her, their powers absorbed into the Brood Imperiatrix. Now possessing the powers of Captain America, Hulk, Phoenix, Scarlet Witch and Spider-Man, The Imperiatrix was a formidable opponent indeed. Iron Man's group finally reached the arena, after defeating Brother Royal's Elite Shock Troops, and did battle with the Imperiatrix, weakening her with repeated attacks until only her powers over Rogue remained. Warbird, whose powers Rogue had brutally stolen years before, leaving her comatose, saw this as an opportunity to kill two birds with one stone, and attacked Rogue with all she had. As the other heroes were teleported home, Warbird literally beat the Imperiatrix out of Rogue's body . The last remaining heroes escaped, moments before The Imperiatrix' starship was destroyed by Badoon treachery, taking with it all of the technology used to create the holographic beings of the Coterie. Both the Brother Royal and Brood Imperiatrix escaped, but the Imperiatrix exacted her revenge upon the treacherous Badoon. Comments: Created By Chris Claremont, Michael Ryan, and Livesay & Hayssing. 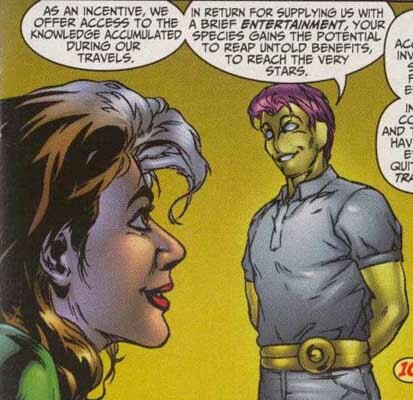 A Coterie is defined as " A small, exclusive group of persons who share numerous interests or pursuits"
The Hostess said she represented the Coterie, The Coterie was, in actuality the Badoon/Brood alliance, but as the holographic race was used as a front for the true Coterie, I have referred to them as such. Had the Badoon and Brood confronted the heroes directly, they wouldn't have stood a chance. These "beings" are merely the face of the Coterie. For more information on the TRUE Coterie, please read the profiles for Brood Imperiatrix and Brother Royal. After this, the emnity between Warbird and Rogue seems to have abated, at least, they haven't tried to kill each other again...yet. The Brood Imperiatrix, as Rogue, was able to steal Spider-Man's powers by touching a bare spot on his neck, apparently she pulled his mask up just enough to hit skin. Hostess Snack Cakes , those tasty treats which have given us so many great mini-comics over the years. HOST: The Coterie Host appeared (With slight variation) to Rogue and the other heroines taken aboard the vessel. The handsome, smooth-talking male Coterie was used to put the women at ease. HOSTESS: The Hostess appeared (With slight variation) to Iron Man, Johnny Storm and the other heroes taken aboard the ship. A beautiful Female, she was used to put the men at ease (sort of, Johnny's expression didn't say calm.) Iron Man saw through her deception though. "YUKIO": Yukio is an old friend of Wolverine and Storm. her image was selected from Storm's mind to keep her appeased and under control. She and Storm hung out in a holographic Tokyo. "ZURI ": Zuri is T'Challa's uncle and mentor. His image was selected from Black Panther's mind, to gain his trust and put him at ease. He and T'Challa shared a hunting expedition before the contest began. "SHARON CARTER": Sharon Carter is an agent of SHIELD, and Captain America's lover. Her image was selected from Captain America's mind, and the two lovers had a friendly duel. "ILLYANA RASPUTINA": The late Illyana Rasputina was retrieved from Kitty Pryde's mind to gain her trust, but Kitty's violent reaction to the Nanites made her presence useless. "MARY JANE WATSON PARKER ": was taken from Peter Parker's mind, and used to keep him distracted and at ease before the competition. THE ANNOUNCER: True to form, the Coterie Announcer appeared as a beautiful female to the heroes, and a handsome male to the heroines. The Announcer mediated all the battles. COACH: The Coach was seen judging the basketball game between the New Warriors and the Slingers, he has the distinction of being the only Coterie with facial hair. THE GIRL WITH THE SIGN was a beautiful female dressed in a bikini carrying a sign proclaiming the beginning of the bout between Iron Man and X-Force. HAREM GIRLS: Two beautiful females in skimpy clothing who doted on the victorious Johnny Storm, who lounged around dressed like Hugh Hefner. NANITES: The Nanites utilized by the Badoon and Brood to control the heroes resembled minute winged insects, and were all-pervasive aboard the Brood vessel. They affected the mental state of the victims, causing deep aggression and violent tendencies. They were unable to affect Iron Man due to his armor, and were unable to control Kitty Pride due to her naturally "Phased" state, though they did cause her incredible pain in trying. It is unclear whether the Badoon or the Brood created them, but they were very effective. Once a hero was defeated and sent to the jungle as fodder for the Brood Princesses, the Nanites would suppress their host's power's completely. They were reprogrammed by Iron Man, and rendered harmless. The Nanites had no effect on either the Badoon or the Brood aboard the vessel, presumably they were programmed to be host specific.